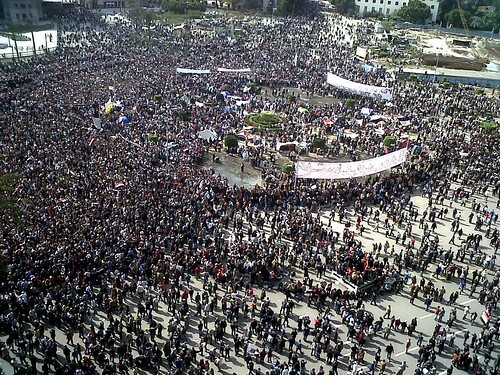 “We, who buried the pharaoh,” is just one of the many slogans proudly published by the young Egyptian protesters on the social networks after the fall of Hosni Mubarak, who was portrayed as a solid dictator but was nevertheless overthrown in just 18 days of massive protests in the Egyptian capital and other cities throughout the country. It all points out that the protesters achieved their goal without external help, even if the EU showed its support once it had become obvious that protests were not just a glimpse of light that would have normally been succumbed by the strong hand of the dictator. All in all, UE democratization policies had very little to do with the sudden uprising of the peoples of Egypt and Tunisia. It could very easily be argued that in the previous decades the EU turned its back on them by supporting the dictatorships in the Arab countries as a warrantee for stability in the region, but things are not just black and white and should be seen from a wider perspective. Even though the EU, and its Mediterranean member countries in particular, was very much apprehensive about the political stability in its immediate vicinity, the fact is that the EU has always opted for more low-profile democratization policies, aimed at reaching their goal only at medium or long term, especially in the light of the long-lasting consequences of imposing democracy in Iraq and Afghanistan. Therefore little can be reproached to the EU, and the fact that the Egyptians are the sole owners of the -tremendous- success achieved in those 18 days will have positive consequences and provide strong foundations for a stable democracy in the future. In spite of what it may seem, the EU was not completely inactive in this regard; what it did was adjust its democratization policy to the facts on the ground and pursued a more bottom up approach based on the soft power reflected in the three baskets of the Barcelona Process, which started in 1995: political cooperation, economic interaction and social assistance. The aim therefore was not a straightforward push for democratization in the region, but rather to foster a dialogue on political liberalization and provide a positive adherence to basic democratic norms. But the EU was very discreet and many of the democracy-linked suspension clauses of the Association Agreements signed with the Arab countries, were never used by the EU’s diplomacy. Many times it probably went too far by turning its eyes away from flagrant disrespect of basic democratic principles,but from the post-revolution point of view this tactic does not seem that erroneous after all. The way the Egyptian revolution has materialized leaves the main opposition force in Arab countries – radical Islamic parties, such as The Muslim Brotherhood in Egypt – without the strongest argument they could use in pursue of their political goals: that the EU has come to impose its ideology through the then existing political elite, which could very easily be portrayed as western anti-Islamic agents. Something similar to what we saw in Iran in 1979 seems a very likely result of such a scenario. But the EU (and the Unites States to a lesser extent) had almost nothing to do with it. Furthermore, not only was the Egyptian uprising done by the people of Egypt, it also seems that it was done without preparation from the Islamic parties (or any other parties) of the opposition which found themselves as unprepared as the regime itself when the demonstrations broke out. According to a survey done among the protesters in Cairo and Alexandria only 15% of those polled approve of the Muslim Brotherhood, 12% would apply sharia (the Islamic Law) and only 7% believe that the regime is not Islamic enough. It seems that at least for the time being the radical Islamic parties are not able to channel the anti-Mubarak sentiment into their own benefit. In short, the fact that the Egyptian revolution has been achieved by its people, without any active external democratization activities, gives their success a moral legitimacy which disarms radical Islamic parties and provides strong foundations for a future democracy. Slovenian, Graduate in Sociology of Culture and Professor of History, University of Ljubljana (2007); Master in International Relations, Institut Barcelona d’Estudis Internacionals (2009). International Relations have been one of my passions for a very long time particularly due to my curiosity for everything that goes on beyond the borders of my most proximate vicinity. Oversimplifications in comprehending international politics are abundant and therefore I believe that providing straightforward explanations of the events in the international stage is necessary and has the potential of bringing together the citizen and the political elites, as well as fostering democratization processes on a global level.